For some linguists of the early 20th century, the Putonghua, or "common tongue/speech", was conceptually different from the Guoyu, or "national language". The former was a national prestige variety, while the latter was the legal standard. 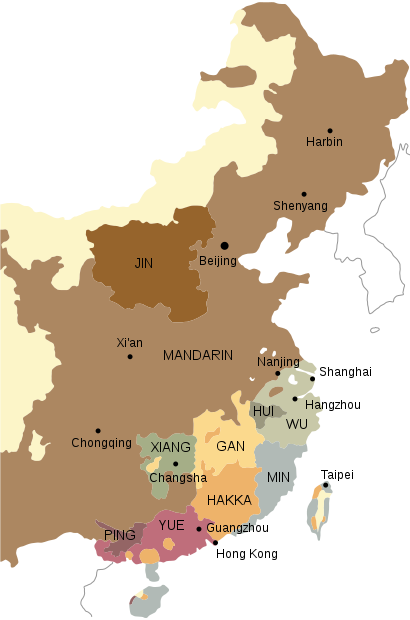 The Beijing dialect (simplified Chinese: 北京话; traditional Chinese: 北京話; pinyin: Běijīnghuà), also known as Pekingese, is the prestige dialect of Mandarin spoken in the urban area of Beijing, China. It is the phonological basis of Standard Chinese, which is the official language in the People's Republic of China and Republic of China and one of the official languages in Singapore. Although the Beijing dialect and Standard Chinese are similar, various differences generally make clear to Chinese speakers whether an individual is a native of Beijing speaking the local Beijing variant or is an individual speaking Standard Chinese. Mandarin, officially Modern Standard Chinese, is the official language used by the People's Republic of China, the Republic of China (Taiwan) and Singapore. The word mogwai is the transliteration of the Cantonese word 魔鬼 (Jyutping: mo1 gwai2; Standard Chinese: 魔鬼; pinyin: móguǐ) meaning "monster", "evil spirit", "devil" or "demon". The Old National Pronunciation (simplified Chinese: 老国音; traditional Chinese: 老國音; pinyin: lǎo guóyīn) was the system established for the phonology of standard Chinese as decided by the Commission on the Unification of Pronunciation from 1913 onwards, and published in the 1919 edition of the Guóyīn Zìdiǎn (國音字典, "Dictionary of National Pronunciation"). Although it was mainly based on the phonology of the Beijing dialect, it was also influenced by historical forms of northern Mandarin as well as other varieties of Mandarin and even some varieties of Wu Chinese. The artificial nature of the system proved impractical, and in 1926 a decision was made to normalize the pronunciations to the natural pronunciations found in Beijing, which resulted in a revised Guóyīn Chángyòng Zìhuì (國音常用字匯, "Vocabulary of National Pronunciation for Everyday Use") published in 1932. Philippine Mandarin (simplified Chinese: 菲律宾华语; traditional Chinese: 菲律賓華語; pinyin: Fēilǜbīn Huáyǔ) is a variety of Standard Mandarin Chinese widely spoken by Chinese Filipinos. It is based on the phonology of the Beijing dialect and the grammar of Vernacular Chinese, and is identical to the standard of Mandarin used in the Republic of China, Taiwan that is called "Guoyu" (國語). In terms of phonology, vocabulary and grammar, Standard Philippine Mandarin is similar to "Guoyu" (Standard Chinese in the Republic of China (Taiwan)) because almost all use dictionaries and books from Taiwan. Many Chinese Filipino schools use bopomofo (zhuyin fuhao) to teach the language. Philippine Mandarin uses the Traditional Chinese characters in writing and it is seen in the newspapers. Philippine Mandarin can be classified into two distinct Mandarin dialects: Standard Mandarin and Colloquial Mandarin. These two dialects are easily distinguishable to a person proficient in Mandarin. Standard Mandarin is like the standard language of Taiwan, while Colloquial Mandarin tends to combine Mandarin (simplified Chinese: 华语; traditional Chinese: 華語) and Min Nan Yu (閩南語) or Southern Hokkien features. Level 1-A (97% correct) is required for presenters in national and provincial radio and television. Level 1-B (92% correct) is required for Chinese-language teachers in northern China. Level 2-A (87% correct) is required for Chinese-language teachers in southern China. Level 2-B (80% correct) is required for Chinese teachers teaching other languages in China. Level 3-B (60% correct) is required for civil service jobs.By 2010, the test had been taken more than 35 million times. As it requires strict adherence to the phonology of Standard Chinese, including such features as retroflex initials, erhua and weak syllables, the test gives an advantage to native speakers of the Beijing dialect and closely related varieties over speakers of varieties lacking these features. There are over 3,000 radio stations in China. The Central People's Broadcasting Station, the nation's official radio station, has eight channels, and broadcasts for a total of over 200 hours per day via satellite. Sichuanese Standard Mandarin (simplified Chinese: 四川普通话; traditional Chinese: 四川普通話; Sichuanese Pinyin: Si4cuan1 Pu3tong1hua4; pinyin: Sìchuān Pǔtōnghuà), or Szechwanese Standard Mandarin, also known as Pepper Salt Standard Mandarin (simplified Chinese: 椒盐普通话; traditional Chinese: 椒鹽普通話), is a variant of Standard Mandarin derived from the official Standard Mandarin spoken in Sichuanese-speaking areas (mainly Sichuan and Chongqing) in China, and is often called "川普" (Chuan1pu3 or Chuānpǔ) for short. Unlike Sichuanese (or Sichuanese Mandarin), which is a native language spoken in the Sichuan region and differs greatly from Standard Mandarin, Sichuanese Standard Mandarin (or Chuanpu) arose after the Popularize Mandarin Policy was implemented by the Chinese government in 1956 and is in fact Standard Mandarin with a Sichuanese accent and some elements of Sichuanese vocabulary and grammar. In this view, Chuanpu is, to a certain degree, similar to Taiwanese Mandarin and Singaporean Mandarin, which are influenced by Hokkien and other varieties. Standard Chinese is based on the Beijing dialect of Mandarin. Actual production varies widely among speakers, as they inadvertently introduce elements of their native dialects (although television and radio announcers are chosen for their pronunciation accuracy and standard accent). Elements of the sound system include not only the segments – the vowels and consonants – of the language but also the tones that are applied to each syllable. Standard Chinese has four main tones, in addition to a neutral tone used on weak syllables. This article represents phonetic values using the International Phonetic Alphabet (IPA), noting correspondences chiefly with the pinyin system for transcription of Chinese text. For correspondences with other systems, see the relevant articles, such as Wade–Giles, bopomofo (zhuyin), Gwoyeu Romatzyh, etc., and Romanization of Chinese. The Table of General Standard Chinese Characters (simplified Chinese: 通用规范汉字表; traditional Chinese: 通用規範漢字表; pinyin: Tōngyòng Guīfàn Hànzì Biǎo) is the current standard list of 8,105 Chinese characters published by the government of the People's Republic of China and promulgated in 2014. Of the characters included, 6,500 are designated as common, a reduction from the 7,000 in the earlier List of Commonly Used Characters in Modern Chinese. The list also offers an official table of correspondences between Simplified Chinese characters and Traditional Chinese characters (designating both 'standard' and selected 'variant' forms), effectively serving as Mainland China's standardization scheme for Traditional Characters. Chinese, also known as Sinitic, is a branch of the Sino-Tibetan language family consisting of hundreds of local language varieties, many of which are not mutually intelligible. The differences are similar to those within the Romance languages, with variation particularly strong in the more mountainous southeast. A widely quoted classification divides these varieties into seven groups: Mandarin, Wu, Min, Xiang, Gan, Hakka and Yue, though a more recent classification splits some of these to obtain ten groups, and some varieties remain unclassified. Written Cantonese is the written form of Cantonese, the most complete written form of Chinese after that for Mandarin Chinese and Classical Chinese. Written Chinese was originally developed for Classical Chinese, and was the main literary language of China until the 19th century. Written vernacular Chinese first appeared in the 17th century and a written form of Mandarin became standard throughout China in the early 20th century. While the Mandarin form can in principle be read and spoken word for word in other Chinese varieties, its intelligibility to non-Mandarin speakers is poor to incomprehensible because of differences in idioms, grammar and usage. Modern Cantonese speakers have therefore developed their own written script, sometimes creating new characters for words that either do not exist or have been lost in standard Chinese. With the advent of the computer and standardization of character sets specifically for Cantonese, many printed materials in predominantly Cantonese-speaking areas of the world are written to cater to their population with these written Cantonese characters. Xiangxiang dialect (Chinese: 湘乡话; pinyin: Xiāngxiāng huà) is a dialect of Xiang Chinese, spoken in Xiangxiang, Hunan province, China. It is part of a group of dialects called the Central Xiang dialects. The Yale romanization of Mandarin is a system for transcribing the sounds of Standard Chinese, based on Mandarin Chinese varieties spoken in and around Beijing. It was devised in 1943 by the Yale sinologist George Kennedy for a course teaching Chinese to American soldiers, and popularized by continued development of that course at Yale. The system approximated Chinese sounds using English spelling conventions in order to accelerate acquisition of pronunciation by English speakers.The Yale romanization was widely used in Western textbooks until the late 1970s; in fact, during the height of the Cold War, preferring the Communist pinyin system over Yale romanization was something of a political statement. The situation was reversed once the relations between the People's Republic of China and the West had improved. Communist China (PRC) became a member of the United Nations in 1971 by replacing Nationalist China (ROC). By 1979, much of the world adopted pinyin as the standard romanization for Chinese geographical names. In 1982, pinyin became an ISO standard; interest in Yale Mandarin declined rapidly thereafter.